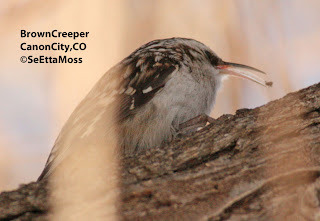 The top pic shows a Brown Creeper with some food it found in the crevices of the bark of the tree on which it was foraging. When I enlarge the pic the food item appears to have tiny legs-maybe a small spider?? 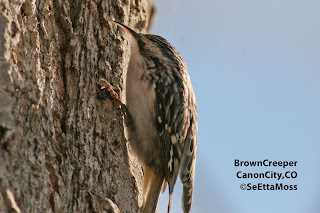 I first heard Brown Creeper high-pitched calls then found two Brown Creepers following each other from tree to tree as they worked their way up, probing for insects and larvae. 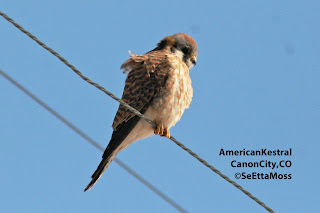 I think most of us enjoy seeing these colorful female American Kestrals, the smallest member of the falcon family. 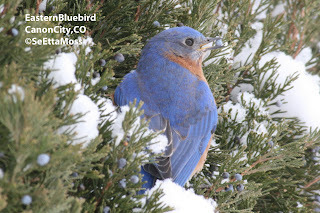 This little lady was hunting in a field in my town of Canon City,CO when I took these pics today. 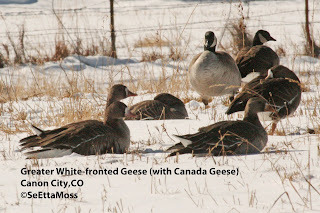 I think this species has such a sweet looking face that conceals the reality that are hunters of live food. 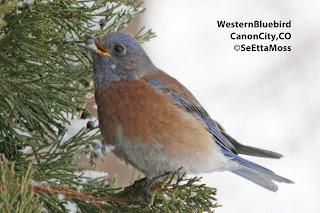 Their prey includs warm blooded critters such as backyard birds (which can be upsetting to those who feed the birds they take), but it also includes mice (which many of us applaud). 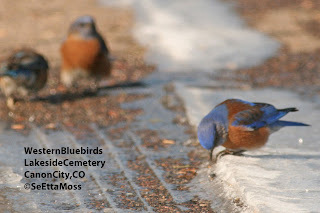 The Eastern Bluebirds in the post below were feeding in a mixed bluebird flock with Western Bluebirds, the species that is fairly common in fields around Canon City, CO.